OK, this is really embarrassing. My goal is to get all you theater people to come to the theater potluck from 7 to 10 p.m. Sunday March 21 — that’s a week from Sunday — at Orlando Rep.
Now I’m always up for a celebration (especially if there is wine or brownies or chocolate-chip cookies on hand, preferably not combined into one foodstuff). But I have to tell you it embarrasses me greatly to be the center of attention. So let’s pretend this is just a regular theater potluck, albeit one that everybody attends. Let’s get together and talk, and eat, and hang out, and just have fun, and forget about all this toasting stuff. I love these evenings. Please come. It’s what fellowship is all about. This entry was posted in Critics, Orlando theater and tagged elizabeth maupin, orlando repertory theatre, theater potluck. Bookmark the permalink. Facebook invite will go out tonight! Elizabeth… I might eventually get to attend! I sure as hell hope so, given the fact that all this was your idea. Will be there with Deviled Eggs. That’s a great photo of you, Betsey! What are you talking about? Have a great time – it looks like a talented team of friends loves you to pieces. To clarify, the potluck was certainly my idea two years ago. 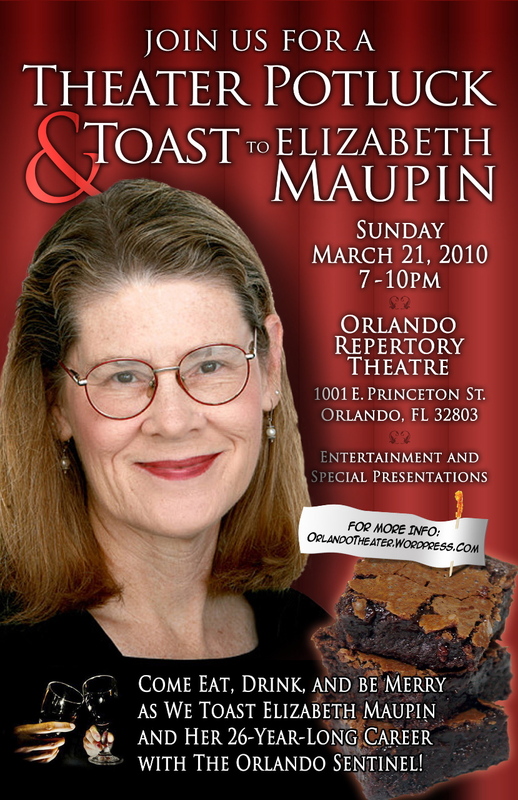 The “toast to Elizabeth Maupin” was arranged by others. ..and as was suggested on John’s Facebook group…Nametags! Yay for food, hanging and nametags!